When the mummified remains of a humanoid were found in a mining town abandoned in the Chilean desert of Atacama in 2003, speculations about its origins were unleashed. 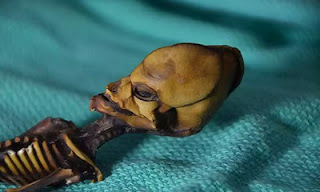 The skeleton, which was sold to a private collector in Spain, was so bizarre that it appeared in a documentary as a potential proof of alien life. Now the Californian scientists have extracted the DNA from the bones and rebuilt the true, tragic story of Ata. Rather than a visitor from another world, she was a baby girl perhaps born dead, or dead soon after birth, with devastating changes on her body. Despite being only 15 centimeters high, the bones had some characteristics of a child between the ages of six and eight. Instead of 12 pairs of ribs, Ata only had 10 pairs, and the head was cone-shaped. Please, we’d like to apologize, Ata, if we have misinterpreted the truth. Because that's what adults do. Try to understand our limits, before the dangerous mixture. Even today, where it is present in a child, or future woman, it is feared as the most powerful weapon of mass liberation. And most of the time we do everything to isolate them and cause them suffering. But not those that fall from the sky in sci-fi stories or undermine our future among the special effects of movies. Those are us disguised, actually. The extra humans that our society obstinately exclude from the family album live next to us, and like you are in credit of our regrets, at least. We are the result of an unnatural equation, which involves the cancellation of unexpected shapes. Finally, we are the ones who demonstrate with the facts of not belonging to the land that hosts us. So, sweet Ata, forgive us and forgive us all. Because in the granted time by a distracted, often cruel fate, we have lost the opportunity to widen the heart and not the eyes.